Newcomers to the village might wonder why there is an ATM in the front of a house in the High St. Here is a picture of that house in earlier days. Eighty years ago there was an ancient rambling thatched house covering this site and that of the post office. 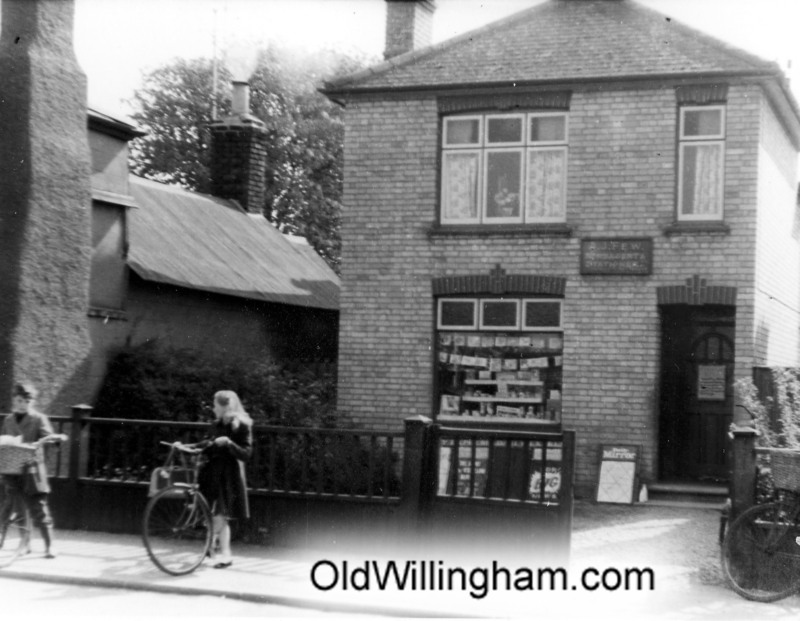 At that time the village newsagent was on Green St., run by Mrs. Few and her daughter Marjory. Eventually, as the village expanded they ran out of space and built two identical houses on the High Street – one for the shop (shown here) and the other to live in. This photo shows the shop in April 1960 when it closed for the last time. After this, one of the houses became the post office and is still just visible behind major modifications. This house went through various changes and ended up, by the 1980s as a branch of Barclays Bank. When the bank closed in the early 2000s there was such an uproar in the village that Barclays agreed to keep the ATM machine for at least 15 years – and it is still there!